By LUDWIG VON KOOPA - Man, that 80% difficulty is tough. We're back! Last night's long Splatoon 2 World Inkling Invitational wasn't enough. 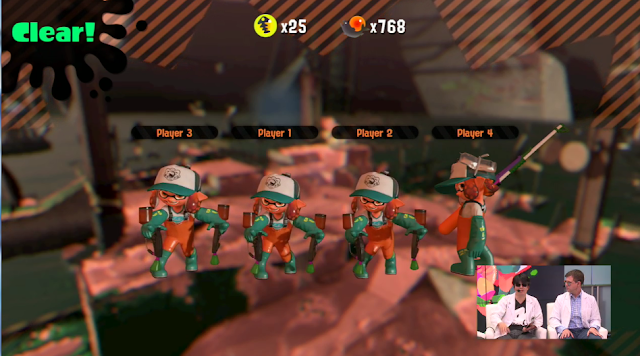 This time, Nintendo Treehouse Live and the Squid Research Lab are giving us an opportunity to watch Salmon Run, the team vs. computer cooperative mode. 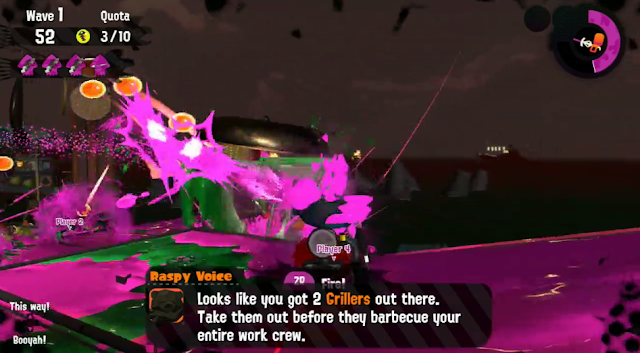 For some background on Splatoon 2's Salmon Run mode, see the April 12 2017 Nintendo Direct here. Oh, and of course, follow E3 Weeks 2017 with the Schedule. (3:26:39 PM) (breezinabout@msn.com) Is this-- Oh yeah, Splatoon 2. (3:26:47 PM) Ludwig Von Koopa: "Mr. Scientists"
(3:26:55 PM) Ludwig Von Koopa: "HI! HI!" This is what the lobby menu looks like. (3:27:38 PM) Ludwig Von Koopa: Hired by corporation to fight off salmonid creatures. (3:28:02 PM) Ludwig Von Koopa: There's a time limit. (3:28:15 PM) Ludwig Von Koopa: I guess you're paid for only a limited amount of time. (3:28:25 PM) Ludwig Von Koopa: Need to collect golden eggs from boss salmonids. (3:28:32 PM) Ludwig Von Koopa: Take it back to egg basket. (3:28:35 PM) Ludwig Von Koopa: Quotas. (3:28:50 PM) Ludwig Von Koopa: Real life has time limits. (3:29:07 PM) Ludwig Von Koopa: or online play. (3:29:23 PM) Ludwig Von Koopa: So online non-fighting mode. (3:29:37 PM) Ludwig Von Koopa: Online features timed events. (3:30:15 PM) Ludwig Von Koopa: Grizzco Industries loans you weapons to use. You're commanded by the Raspy Voice. (3:30:23 PM) (rawkhawk2010) i'll be on the lookout but i kinda feel like all the screens will be...the same. (3:30:43 PM) Ludwig Von Koopa: "offline which you can play whenever you want"
(3:30:49 PM) Ludwig Von Koopa: So you can only play online at select times? (3:31:00 PM) Ludwig Von Koopa: Is this a daily thing? (3:31:29 PM) (rawkhawk2010) Remember that they're treating the Switch like a portable. (3:31:45 PM) Ludwig Von Koopa: How's that affect this? (3:31:49 PM) (rawkhawk2010) Meaning you'll only have access to a router at "select times"
(3:32:07 PM) Ludwig Von Koopa: aka when you're at home? (3:32:15 PM) Ludwig Von Koopa: After work? (3:32:32 PM) Ludwig Von Koopa: Does that mean we'll have regional matchmaking instead of worldwide? (3:33:21 PM) (rawkhawk2010) Reggie won't have the pleasure of online capabilities while he's tanning on that barren beach, for example. (3:33:37 PM) (rawkhawk2010) Unless he uses his phone as a hotspot. (3:33:41 PM) Ludwig Von Koopa: He claims to work 16 hours a day. Good job, you delinquents had a real day of part-time work! (3:34:31 PM) (rawkhawk2010) I know someone in New York who says that but eight of those hours is just them keeping their phone on in case someone from work calls them. (3:34:48 PM) (rawkhawk2010) They treat that as working an additional eight hours. (3:34:53 PM) Ludwig Von Koopa: Reggie always considers playing games as work. (3:35:14 PM) Ludwig Von Koopa: But it's also possible he doesn't play games much since he's not very good. (3:35:17 PM) (rawkhawk2010) Do you treat logs as work? (3:35:28 PM) Ludwig Von Koopa: I consider it a hobby. (3:35:59 PM) (rawkhawk2010) Reggie consideres it a FEATURE! 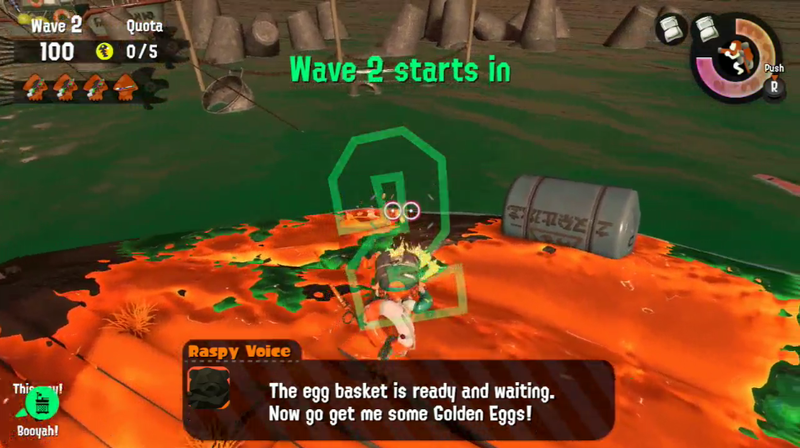 (3:36:19 PM) Ludwig Von Koopa: Random events in salmon run like fog. (3:36:25 PM) Ludwig Von Koopa: So you should like that. (3:36:55 PM) Ludwig Von Koopa: Because you like random events. (3:37:37 PM) Ludwig Von Koopa: It was there for the whole wave but there are three waves. (3:37:37 PM) (rawkhawk2010) I wouldn't like an entire seven minutes of City Trial in fog. (3:37:45 PM) (rawkhawk2010) Or three minutes. (3:37:54 PM) Ludwig Von Koopa: ...the music is really good though. (3:38:01 PM) (rawkhawk2010) I couldn't hear it. (3:38:07 PM) Ludwig Von Koopa: I meant Dense Fog Today. (3:38:16 PM) (rawkhawk2010) I thought you meant here, lol. (3:38:24 PM) Ludwig Von Koopa: No I can't hear it. (3:38:58 PM) Ludwig Von Koopa: They describe normal Splatoon modes as a zero-sum game so for the sequel they wanted a cooperation mode. (3:40:02 PM) Ludwig Von Koopa: You get better rewards for surpassing the quota. (3:40:29 PM) Ludwig Von Koopa: In the online mode you can win special gear you can take to multiplayer. (3:40:48 PM) Ludwig Von Koopa: ala story mode in Splatoon 1. (3:42:30 PM) Ludwig Von Koopa: "I think it was a little too easy last time"
(3:42:45 PM) Ludwig Von Koopa: "Pumpa-uppo"
(3:43:01 PM) Ludwig Von Koopa: As a translation of "pump up the difficulty"
(3:43:06 PM) Ludwig Von Koopa: "It's all about that pumpa-uppu." 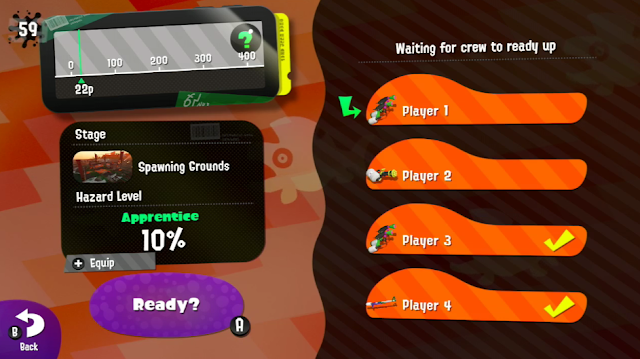 (3:43:30 PM) Ludwig Von Koopa: 30% was "Part-Timer" difficulty, 80% is "Profreshional"
(3:43:43 PM) Ludwig Von Koopa: The Salmonids is another species ala Inklings and Octarians. (3:44:06 PM) Ludwig Von Koopa: Can swim freely on water as well as on land. (3:44:48 PM) Ludwig Von Koopa: "Try again?" options are "Never give up!" and "Give up"
Barbecue? BBC the work crew? (3:45:17 PM) Ludwig Von Koopa: Salmonids collect resources for their society. (3:46:09 PM) Ludwig Von Koopa: Golden eggs are akin to petroleum. (3:49:00 PM) Ludwig Von Koopa: if you start at 100% and clear it 20 times in a row. (3:49:16 PM) Ludwig Von Koopa: But even the Squid Research Lab has "great difficulties" clearing 200%. (3:52:28 PM) Ludwig Von Koopa: "I think I'm going to short-circuit this system with my hand sweat, to be honest. IT's disgusting." (3:54:23 PM) Ludwig Von Koopa: Trying 80% again. (3:54:56 PM) Ludwig Von Koopa: "This is an event called salmon rush"
(3:55:02 PM) Ludwig Von Koopa: Huge zerg rush of small salmon. (3:55:06 PM) Ludwig Von Koopa: With goldies. Right after that, they got a game over again. Next log will be Mario + Rabbids Kingdom Battle (boo) and more Super Mario Odyssey (yay!). Be sure to see the log before this, being Yoshi on the Nintendo Switch! I'm glad that Salmon Run has offline play. I think that this may turn out to be one of my favorite modes even though I do not expect to ever finish a stage over the 100% difficulty if they had trouble with just 80% difficulty. You'll have people offline to play it with?